Take a few steps into the primal world, and you’re going to stumble upon paleo bone broth sooner rather than later. It’s a staple component of the caveman diet, and there’s quite the laundry list of reasons why. Before I get into the benefits of paleo bone broth, let’s cover basic ground first. So what is bone broth? If you haven’t put two and two together already, paleo bone broth is simply stock made from bones. This is the way soup was meant to happen. The difference between broth and stock is the animal parts that are used to flavor the water. 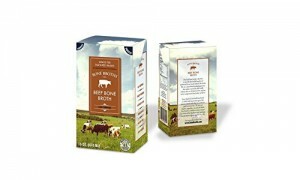 In a stock – like the ones you purchase in the carton from the store – the whole animal is used. While this is a viable option, you get a whole lot more nutrition when you boil the bones instead. With the addition of the right veggies and spices, you could produce a richer flavor as well. Roasted marrow makes tasty broth. 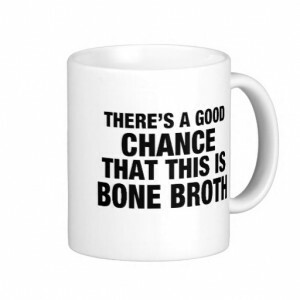 If you’ve got bones and water, you’ve got what it takes to make a mean cup o’ paleo bone broth. The nutritional profile of homemade broth is all over the place as you might imagine. First and foremost, it depends upon the type of bones you use. Bones from grass-fed cows or pastured chickens will offer a completely different nutrient complex than bones sourced from conventional animals. When you pressure-cook, slow-cook, or boil the bones, you extract all the proteins, amino acids, minerals, and healthy fats for that liquid gold just simmering away. Finding quality bones is much less expensive than purchasing the quality meat itself. If you have a local butcher, just ask for some scraps. They’ll often offer them up for free. Chicken feet, heads, and necks are the best ingredients to get your broth gellin’ which naturally indicates gelatin production. Start saving veggie scraps (carrot tops, the bottom of your celery stalks, the tops of onions) in the freezer to add extra flavor and nutrients. 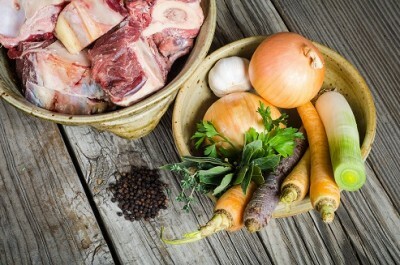 What are the benefits of paleo bone broth? It’s going to good use. 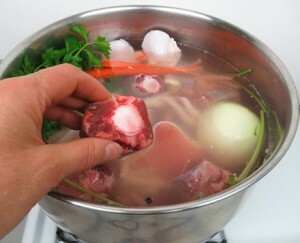 Minerals from bone broth are both abundant and easy to absorb. The body processes vitamins and minerals differently depending on the source. Broth is easy to digest which increases nutrient absorption. Its gelatin content also helps to maintain optimal gut health. 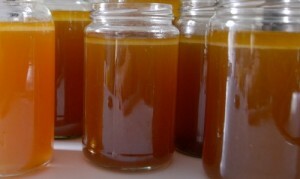 When the gut is happy, the body is more receptive to maximize the benefits of bone broth. Beauty food? This food is as good for the inside as it is for the outside. Soup from scratch promotes healthy skin, hair, and nails. How so? Collagen! Collagen makes up much of the skin structure, so consumption of collagen helps support firmer skin and reduce the forming of wrinkles. Collagen helps hair to grow quickly and results in less breakage for both hair and nails. Strong bones and joints. Paleo bone broth can get you strong and mobile as it helps to maintain and heal bones and joints. People who suffer from arthritis and tendonitis may benefit. 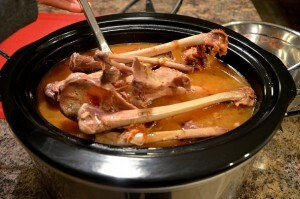 The proteins found in gelatin (found in bone broth) help repair connective tissues. 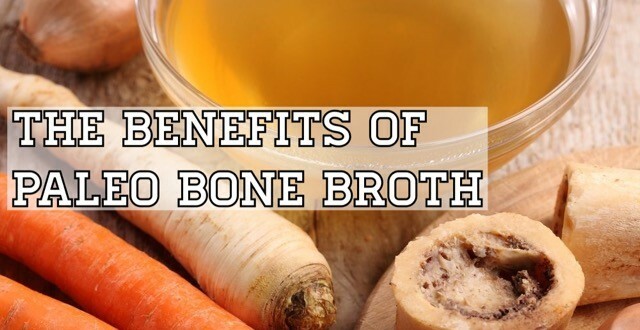 Bone broth makes an awesome workout supplement as it could also help to prevent injury. Amino acids. Let’s talk proline, glycine, and glutamine to be precise. Truthfully, we’re only scratching the surface here. The benefits of paleo bone broth very much lie in the variety of both essential and non-essential amino acids. Non-essential aminos are especially important for athletes. Although the body produces non-essential amino acids, the stores can get depleted. Proline is essential to the structure of collagen; it helps the body break down proteins, maintain muscle tissues, and keeps joints flexible. Glycine helps the body to detox, digest, and heal from wounds. Healing power. Chicken soup has a reputation as a cure-all for any bug you might come down with for a reason. Glutamine, as mentioned above, is vital to healing a leaky gut which can improve autoimmune conditions. Bone marrow, which can be used to produce broth, is a vital part of the immune system and will help fuel the cells for optimal immune health. As mentioned above, paleo bone broth contains a lot of easily-digestible nutrition which makes it perfect for sipping on when you’re too sick to stomach solid food. If all the benefits of bone broth are convincing enough on their own, it’s time to learn how you can master the trade. Good news? It truly couldn’t be easier. Let’s talk method first. Keep it old school with a big, heavy-bottomed stock pot. Tend to it over the fire like the cavemen did. Or you can just use the stovetop which will work just as well. Besides, we can’t sit in front of a fire for the whole 36 hours this takes to cook. This option may not be the most efficient way, but it will work. Use one gallon of water per 2 lbs. of bones. 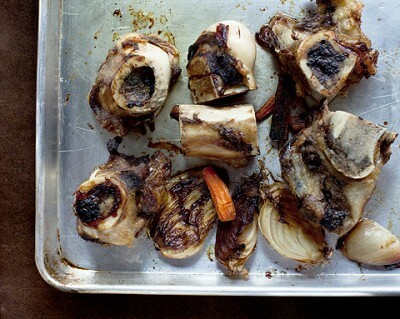 If you’re using beef or marrow bones, roast them first to extract flavor. If you want even better flavor, add in (per gallon of water) 1 onion, 2-3 carrots, and 2-3 celery stalks. Optional add-ins include whole garlic cloves and fresh herbs. Bring bones to a boil and let simmer. See times below. Note: Beef broth should simmer for 48 hours. Chicken broth should simmer for 24 hours. Fish broth needs about 8 hours. Set it and forget it with the beloved slow-cooker. 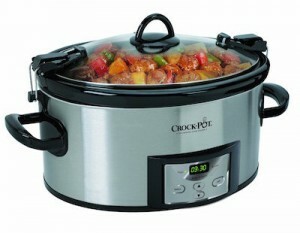 You’ll follow the same steps as you would to prep the pot for the stove, but load up the crock pot instead. You can turn it to low for anywhere from 12-48 hours. Consider the work done. This is a great method if you’re going from slow-cooking a whole chicken straight into canning up some broth. No clean-up while moving onto the next project. Last but not least is arguably the quickest way to get a quality batch of bone broth. Generally, longer cooking time means a better final product when it comes to broth, but the Instant Pot defies that logic. With its almighty power, this is easily the best kitchen gadget to accommodate the paleo lifestyle. Unlike the rest, this method will take less than two hours from start to finish. Bonus: If you’re following a low-histamine diet, pressure-cooked paleo bone broth can be a lot more tolerable than a slow-cooked version. What do I do with all that broth? 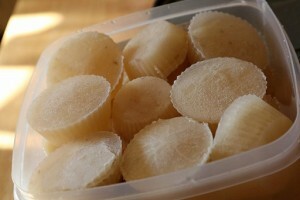 Use ice cube trays (silicone is preferable) and freeze it up. Once the liquid is solid, you can transfer easy-to-use pucks of broth to a large container or bag. Just grab a few each to cook with when it’s called for. This is the most effective means of storage for convenient use. Mason jars are your next best bet. Just make sure to leave a little room at the top for the liquid to expand when it freezes, and be careful about rapid temperature changes because, well, broken glass! The down side? Waiting for it to thaw before you use it. Don’t forget to check out our favorite paleo chicken soup recipes, all of which are made better with homemade paleo bone broth. A steady supply of paleo bone broth on hand is great for soups, stews, braises, and steaming your veggies with a little extra flavor, but did you know it’s good for sipping, too? It’s a fantastic substitution for caffeine if you’re trying to kick your coffee habit, and it’s ideal to wind down with before bed. The gelatin and collagen offer some trace amounts of protein. This can aid in a good night’s rest without having to consume any solid food before bed which is known to be intrusive to restful sleep. Add spices. The addition of spices might make your bone broth more palatable on its own. Turmeric is a great choice for its anti-inflammatory, healing properties. An Italian herb mix will help it take on a savory mouth-feel. Paleo bone broth latte? You might think this cocktail is a little outlandish initially, but if you’ve had bulletproof coffee, this is right up your alley! Blend up some hot broth with butter, coconut oil, and MCT oil for some serious brain food. Throw in some veggies. Afternoon munchies got you craving sugar? Knock ’em out with a mug of broth and some green veggies. Lightly steam spinach in a little bit of the stock. Add salt, pepper, and spices of choice for a tasty snack that is sure to satisfy. Don’t forget the vinegar! 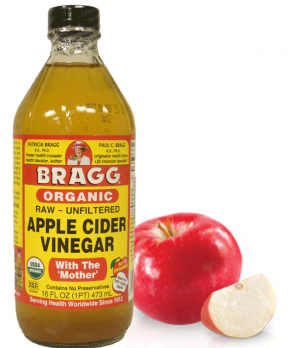 Any reputable recipe will add a splash of raw apple cider vinegar. Why’s that? 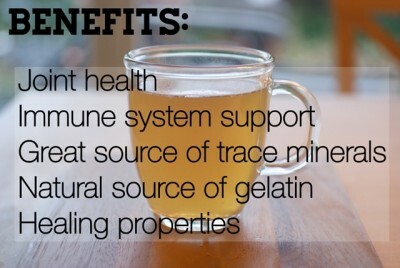 The benefits of bone broth are increased with optimal nutrient extraction. The acid from the vinegar helps draw all the minerals from the bones. Real salt won’t just add depth and help bring out flavor in your homemade batches of paleo bone broth. It’s essential to good health! It helps to manage blood sugar levels, it’s a natural antihistamine, and it can even help you sleep. Most store-bought stock brands have “low sodium” options, but making your own means that you can control those levels. 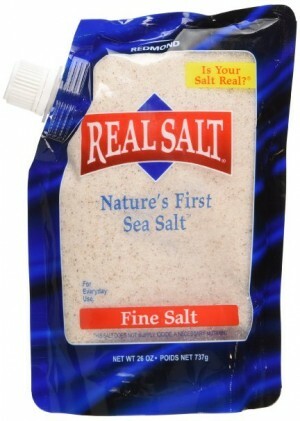 Choose real salt and add 1-2 tbsp. per batch which will go a long way. If you haven’t mustered up the confidence to try your hand at homemade yet, you can still get the benefits of paleo bone broth delivered right to your door. Bone Broths Co. offers a shelf-stable, paleo-friendly product to keep the pantry stocked. Your soup will never suffer again. The more you know! 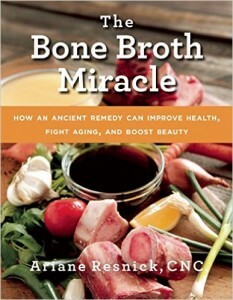 Up your knowledge of the benefits of paleo bone broth and all it has to offer with ‘The Bone Broth Miracle’ by Ariane Resnick. This book will shed some light on both nutrition and new and interesting recipes. Hands off cooking is the best kind of cooking. Paleo bone broth is a recipe that even a beginner could master. Get your hands on a slow-cooker and let it work its magic. You’ll be rewarded with a big pot of stock, minimal clean-up, and a successful batch every single time. 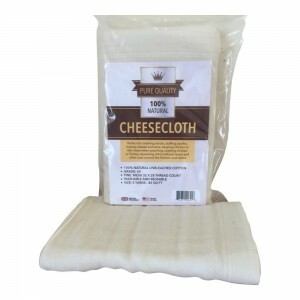 To get the best strain on your homemade paleo bone broth, unbleached cheesecloths will come in handy. You can choose to use a strainer, but you might end up with small scraps and more fat content. This will give you the smoothest final product for storage.